› Author Affiliations Funding This research was conducted at the University of Birmingham. This research was funded by the National Institute for Health Research (NIHR) Collaboration for Leadership in Applied Health Research and Care West Midlands (NIHR CLAHRC WM). The views expressed in this article are those of the author(s) and not necessarily those of the NHS, the NIHR or the Department of Health and Social Care. Objective Oral anticoagulant (OAC) prescription for stroke prevention in atrial fibrillation (AF) patients frequently does not follow current guidelines, with underuse in patients at high risk of stroke and substantial overuse in those at low risk. This review aims to systematically evaluate the effectiveness of interventions to improve appropriate OAC prescription in eligible AF patients for stroke prevention. Methods Systematic review of controlled and uncontrolled studies published up to July 2017 with interventions designed to improve appropriate OAC prescription for stroke prevention in eligible AF patients (according to risk assessment tool or guidelines). Categorization of intervention types was pre-specified. The main outcome was change in proportion of eligible AF patients prescribed OACs for stroke prevention. Results Twenty studies conducted in 392 settings were included (cluster randomized controlled trials, controlled trials and uncontrolled before-after designs; n = 29,868 patients at baseline). Fifteen studies reported significant improvements in appropriate prescription of OACs in AF patients. 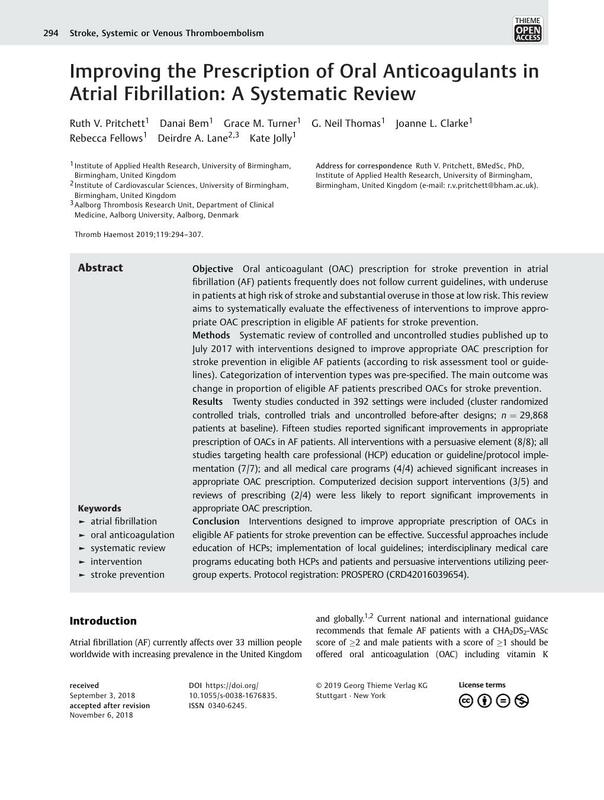 All interventions with a persuasive element (8/8); all studies targeting health care professional (HCP) education or guideline/protocol implementation (7/7); and all medical care programs (4/4) achieved significant increases in appropriate OAC prescription. Computerized decision support interventions (3/5) and reviews of prescribing (2/4) were less likely to report significant improvements in appropriate OAC prescription. Conclusion Interventions designed to improve appropriate prescription of OACs in eligible AF patients for stroke prevention can be effective. Successful approaches include education of HCPs; implementation of local guidelines; interdisciplinary medical care programs educating both HCPs and patients and persuasive interventions utilizing peer-group experts. Protocol registration: PROSPERO (CRD42016039654). K.J., R.V.P., D.A.L., G.N.T., D.B. and J.L.C. conceived the review and developed the methodological strategy; D.B., N.T., R.V.P. and R.F. performed the study selection; R.V.P., D.B. and G.N.T. performed study selection, data extraction and quality assessment with K.J. and D.A.L. as arbitrators. R.V.P. drafted the paper with input and critical review from all authors.